Would you like to have a STYLISH, UNIQUE and STRESS-FREE ceremony? Congratulations, on your Engagement – what an exciting time for your both! On your wedding day you want to look amazing, but also feel amazing with a great sense of enjoyment and ease as you’re guided throughout the ceremony! Your ceremony is the first official start of your wedding day and your marriage- you want to get it right from the very beginning with no regrets! 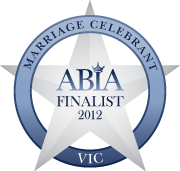 I am one of Melbourne’s HIGHLY ELITE, younger Marriage Celebrants, authorised as a Civil Celebrant by the Attorney General at the end of 2009. I have currently officiated over HUNDREDS of weddings for HAPPY COUPLES and I have WON many awards for my outstanding service voted by my past gorgeous couples. I specialise in ONE wedding per day and I am absolutely PASSIONATE about what I do! I love getting to know a couple and their story. I will provide you with extensive resources and helpful tips so together we can craft and deliver your perfect ceremony! Guides you seamlessly through the process and on your Big Day? With my expertise and experience you will feel that the ceremony process and your Wedding day will be smooth sailing, reducing stress, reducing anxiety and not feeling overwhelmed as I have everything under control in regards to your ceremony. You will actually find working with me throughout the process and on your big day enjoyable and fun- the way it is meant to be. 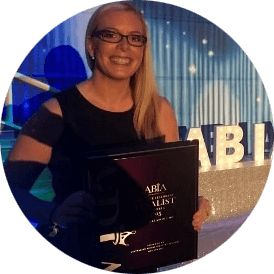 Is reliable, easy to relate to, friendly, flexible, genuine, fun, thorough & professional? 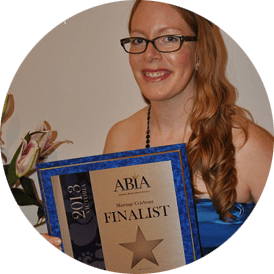 Through my varied characteristics/qualities, it really allows me to be the Celebrant of your Dreams by providing you with fresh ideas, up-to-date trends, and a very confident and competent wedding specialist for your Wedding day. That listens to want you want? Being a good listener allows me as your Celebrant to create a ceremony that reflects you as a couple and incorporate your desires into your ceremony = Happy Couple! Gives you ideas and tips to make it a stress-free experience? Through officiating over hundreds of wedding, I have gathered many fabulous tips and ideas that you will find helpful, reducing any underlying stress of not having been married before or married previously and forgetting all the small details. Only does ONE wedding per day-focusing on you? Only officiating one wedding a day allows me to give my couples 100% of my attention and focus! You are my number ONE priority on your Wedding Day! 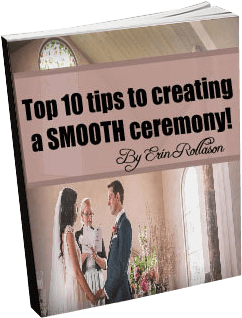 FREE TOP 10 TIPS to creating a SMOOTH ceremony! Plus you’ll also receive 7 helpful tips for choosing your DREAM celebrant. NB: Please check your junk or spam email folder, if your tips are not in your Inbox. We would like to thank you for making our wedding ceremony so MEMORABLE. We had TOTAL CONFIDENCE on the day that everything would go to plan (maybe not the weather) thanks to your PATIENCE with our questions, and HELPFUL ADVICE. You delivered a ceremony that was TRULY UNIQUE to both Nicky and myself and the sand ceremony added an extra special touch. You can be PROUD OF YOUR EFFORTS because we received such POSITIVE COMMENTS from our family and friends, your PROFESSIONALISM and EQUIPMENT provided on the day especially did not go unnoticed by all. Finally, best wishes and good luck with your future weddings, our day was PERFECT from START TO FINISH and we thank you ever SO MUCH for your contribution. The day was FANTASTIC. Erin you did a FANTASTIC JOB! Thanks so much for all your EFFORTS. You really HELPED us and ALLOWED us to enjoy the journey FREE OF STRESS and WORRY. 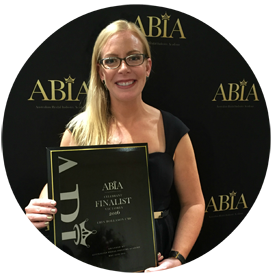 Your ORGANISATION skills were an area of strength as everything was METICULOUSLY planned, your APPROACHABILITY, your WILLINGNESS to LISTEN and your KNOWLEDGE! People are STILL TALKING about how LOVELY the ceremony was which is a CREDIT to you. Loads of them are asking for copies of the ceremony. Thanks for sharing our special day. You are FOREVER part of the most joyous day of our lives. Erin was ENCOURAGING, KNOWLEDGEABLE and REALLY CARED about making our ceremony PERFECTLY SUITED to us. We felt completely at EASE throughout the ENTIRE PROCESS- she was VERY CLEAR about how everything would work. She also had a VERY CALMING and CONFIDENT approach on the day- which definitely came in handy for the nervous bride! 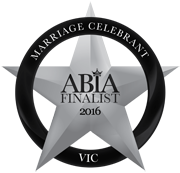 Erin is a WELL-ORGANISED and DOWN-TO-EARTH marriage celebrant and we would HIGHLY RECOMMEND her services. Our experience with Erin as our celebrant was PERFECT! This was reaffirmed by later watching and experiencing other friend’s wedding ceremonies. We both agree that you TOP ALL THE OTHER CELEBRANTS! From our first meeting we felt YOU UNDERSTOOD our desires and WHOLEHEARTEDLY SUPPORTED them. By the end of our ceremony, you felt like a CLOSE FRIEND who we wished to share our wedding with. Your INTERPERSONAL skills are a MASSIVE ASSET in this respect. You were VERY ORGANISED always having our documents at hand and everything in relation to the FINER DETAILES and LEGALITIES of the process were CLEARLY EXPLAINED and our meetings were THOROUGH. Things such as the correct pronunciation of our names, clear requirements prior to meetings, through to your RELAXED, CALM approach to our ceremony...You are an ABSOLUTE NATURAL!! A THOUSAND thank yous for EVERYTHING! It was so WONDERFUL to have the BEST CELEBRANT and such a PERSONAL CEREMONY. Erin is an incredibly PROFESSIONAL, really FRIENDLY and COMMITTED celebrant. She made the whole experience SO EASY and so BEAUTIFUL for us. She has THOUGHT of absolutely EVERYTHING and WORKS WITH YOU to make sure your ceremony is PERFECT, and takes the nerves away! Erin, we just wanted to say a huge thank-you for agreeing to be our celebrant for our wedding day. You were VERY PROFESSIONAL, CONFIDENT and HELPED us in EVERY WAY possible. ALL of our guests on the day THOUGHT you were AMAZING, as did we. It really was the BEST DAY of our lives and you PLAYED a HUGE PART in making it the day it was. So thank-you! It was LOVELY to have met you and we have NO HESITATION in RECOMMENDING YOU to FUTURE brides and grooms. Erin, it is because of you that our wedding day was all we DREAMT it would be. From the bottom of our HEARTS, thank you SO MUCH not only marrying us but for making it the AMAZING, FUN day that it was. We are SO GRATEFUL that you were a PART of our special day. You are ONE FANTASTIC WOMAN! 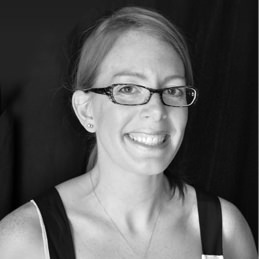 Erin, we just wanted to say a HUGE thank you for being a WONDERFUL celebrant! We KNEW from our first meeting that you would be GREAT. You were RELAXED, FRIENDLY and FUN. You were PROFESSIONAL in all our dealings and we were always HAPPY and CONFIDENT with our choice. On the day you were GREAT. Antony commented on how GOOD you were at KEEPING him CALM while waiting for the ceremony to begin. Erin, you came to see me BEFORE we began to make sure all is ready. During the ceremony you were PROFESSIONAL, UNPRETENTIOUS and HAPPY! Thanks again. Thank you for being such a WONDERFUL celebrant. We found the whole process to be VERY SMOOTH. The wedding ceremony resources given out and covered HELPED US plan our ceremony that we wanted. Erin was VERY ORGANISED, PROFESSIONAL, FRIENDLY, FLEXIBLE and made us feel VERY RELAXED about the wedding ceremony process. Well where to start...Erin LISTENED to what we wanted, had FUN, she was straight to the point, FRIENDLY, kept the EXCITEMENT going, PROFESSIONAL and made EVERYTHING SO EASY! 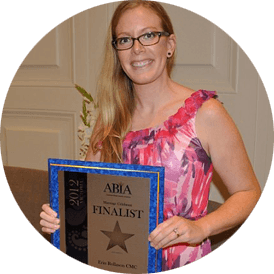 We were BEYOND HAPPY with Erin’s services! Thank-you so much for your HELP and UNDERSTANDING- it meant A LOT! Erin, I can’t honestly can’t think of anything that we weren’t happy with as part of your service. We felt like we were in VERY CAPABLE and RELIABLE hands every step of the way. You were FANTASTIC during the ENTIRE process. The SMALL THINGS you offered and bought to our attention were ESPECIALLY appreciated. Thanks Erin! Thank you so much for the WONDERFUL ceremony you conducted for us. It was EXACTLY WHAT WE WANTED - LIGHT-HEARTED moments mixed with HEART-FELT, personal vows and commentary. So many people commented on what a BEAUTIFUL CEREMONY it was. Even my parents, who wanted us to have a church service, WERE WON OVER! But the most important thing for us was that you had PUT US AT EASE BEFOREHAND so we were able to FULLY RELAX and TOTALLY ENJOY the ceremony. We were not nervous or stressed at all. Thank you again. You helped make our day PERFECT. Thank you for helping CREATE a TRULY WONDERFUL EXPERIENCE for us both! Your FRIENDLY NATURE, GOOD HUMOUR and GUIDANCE was much appreciated. You EASED my calm, jittery nerves and WALKED US THROUGH all the points and expectations of the day. It MEANT SO MUCH that you could be a SPECIAL PART of our special day! Erin, thank you so much for your FANTASTIC WORK as the celebrant for our wedding. You were EXACTLY WHAT WE NEEDED during the planning process, and did an AMAZING JOB on the day. We really appreciated your OPEN and FRIENDLY personality, and were THRILLED to be able to share the day with someone with whom we felt SO COMFORTABLE. We hope you enjoyed the day as much as we did! Thanks you once again. I am CONVINCED we had the MOST AWESOME CELEBRANT in Erin, such a CONSUMMATE PROFESSIONAL and she had us SUPER prepared for the day and beyond. I really ENJOYED meeting up with her to plan our ceremony and then SPENDING THE DAY the day with her marrying us! Thanks Erin, we couldn’t have asked for anything more! You displayed GREAT COMMUNICATION, PROMPT in replies, and you had WEALTH OF KNOWLEDGE about the LEGAL side of marriage. VERY HELPFUL information packs were given and LOTS of material to read through to MAKE OUR CEREMONY A REFLECTION OF US! Thank you! Erin, I am SO THANKFUL that we stumbled upon your number. From the minute we got in touch with you, IT FELT LIKE IT WAS MEANT TO BE. Throughout the 12 months of planning for our wedding it was so NICE TO KNOW that the one thing I didn’t have to worry about was the ceremony. Your PROFESSIONAL MANNER, your ENCOURAGEMENT to reflect on our marriage goals and YOUR WILLINGNESS to put up with our silliness at our meetings was WONDERFUL. You put us at EASE, LAUGHED WITH US and made the whole process SO SMOOTH, EASY and FUN! I cannot say enough thankyou's from both Sam and myself. We had so many comments on the day about how WONDERFUL you were. It was a PRIVILEGE to have you as OUR CELEBRANT and I will RECOMMEND you to everyone I can! BEST CELEBRANT EVER! WOW.....what a WONDERFUL DAY that flew by and it was just what WE WANTED. Your PROFESSIONALISM, WARMTH, and HUMOUR just made it that MUCH BETTER; YOU WERE WORTH EVERY DOLLAR AND MORE!